A treasured colleague, Kerr has spent a lifetime promoting intercultural education and understanding. UCLA International Institute, May 25, 2018 — The International Institute is delighted to announce that Ann Kerr will deliver the keynote address at its 2018 commencement ceremony in Royce Hall on Saturday, June 16, at 6:30 p.m. The ceremony will celebrate the graduation of undergraduates majoring in Global Studies, International Development Studies and International & Area Studies (IAS), as well as graduate students in African Studies, East Asian Studies and Latin American Studies. Ann Kerr has dedicated her professional life to cultivating an informed understanding of the Middle East among Americans. She has worked at the International Institute since 1991, coordinating the Visiting Fulbright Scholar Enrichment Program for the Los Angeles Metropolitan Area. The program offers cultural programming for Fulbright Scholars who hail from countries around the world, including such activities as meeting the editors of the Los Angeles Times, visits to homeless shelters and Warriors basketball games at the Staples Center. The Institute staffer also regularly teaches a Fiat Lux course that introduces UCLA freshman to these visiting international scholars, who speak about their countries and share their impressions of America with the students. The course has inspired many Bruins to study abroad. Ann herself is beloved by both her students and the faculty and staff of the International Institute. Ann met her first husband Malcolm Kerr (1931–1984) — a well-known specialist on the Arab world and longtime professor of political science at UCLA — when she did a study-abroad year at the American University of Beirut (AUB) as an undergraduate. She, Malcom and their children spent many years in the Middle East, principally in Lebanon and Egypt (where she taught English at both AUB and the American University in Cairo). In 1982, Malcom Kerr left UCLA to become president of AUB. Tragically, he was assassinated in front of his AUB office in 1984. 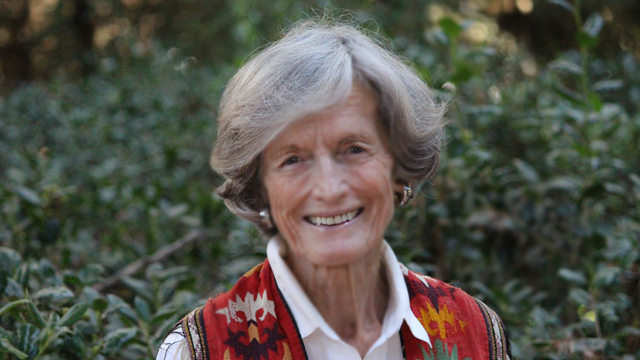 In October 2017, Ann and her children — Susan Kerr van de Ven, John Malcolm Kerr, Stephen Douglas Kerr and Andrew Stanley Kerr — created the Kerr Family Fellowship at the UCLA Center for Near Eastern Studies. Dedicated to promoting international understanding and peace through education, the endowment underwrites the higher education of young Middle Easterners at UCLA, who are chosen through a competitive application process. The author of two books (“Come with Me from Lebanon: An American Family Odyssey” and “Painting the Middle East”), Ann has been a member of the AUB Board of Trustees for over three decades and recently received an honorary degree from her alma mater, Occidental College. Among her many accomplishments, she has raised an extraordinary family. As Ann likes to say, “I have two Ph.D.s, an M.B.A. and an NBA.” That’s right, her middle son is that Steve Kerr, the former NBA player who has led the Golden State Warriors to two NBA championships since he became head coach in 2014. His impressive siblings include John, an agricultural economist who teaches at Michigan State University and works in international development; Susan, an author (“One Family’s Response to Terrorism: A Daughter’s Memoir”) and elected county counsellor (Liberal Democrat) in the UK; and Andrew, a businessman working in construction in Washington, DC. Ann’s study-abroad and life experiences have led her to actively promote intercultural education and understanding throughout her life. The Institute’s class of 2018 could not have a more suitable speaker. Click here to read an article about Ann that will appear in the June 18, 2018 print edition of The New Yorker. Here are a series of articles written by Ann Kerr about her classmates at the American University of Beirut.